Use our attorney-drafted Notice of Intent to Vacate to give legal notice to the landlord of a property that the renter will be moving out of the building. Account for property and remind yourself of pre and post-move details. The Basics: What is a Notice of Intent to Vacate? 2. The Basics: What is a Notice of Intent to Vacate? 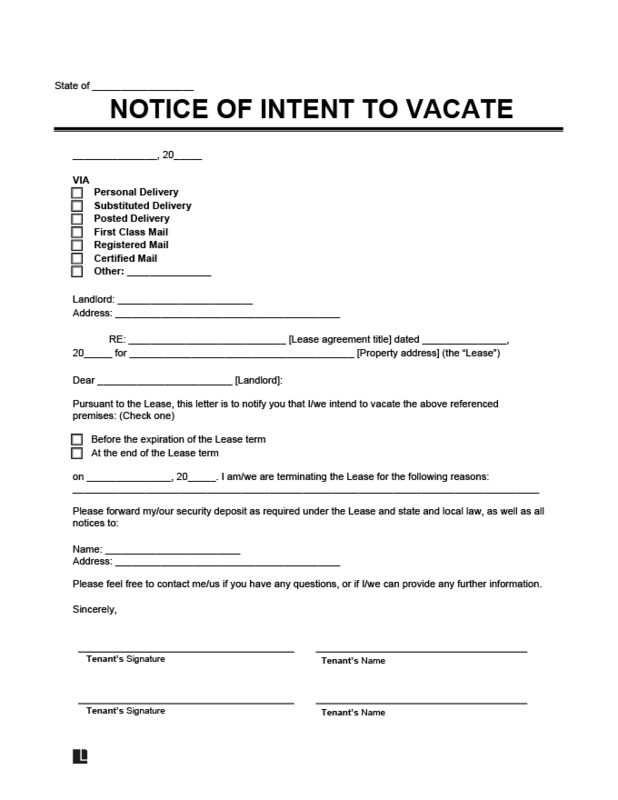 A notice of intent to vacate is a letter written by the renter and addressed to the landlord of a property. The letter is designed to give the owner legal notice that the renter will be moving out of the building. Many renters plan their move based on the renewal time of their lease. If that’s the case, the date you’ll be vacating the apartment will likely coincide with the end of your lease. The notice should be furnished to the property owner prior to moving. The sample notice of intent to vacate below notifies the landlord, ‘Nathaniel F Pena’, that the tenant, ‘Michael S Madden’, intends on vacating the property. The notice should include what date Michael S Madden will leave the property, where the security deposit may be sent to, and details regarding the original lease. If you’re not happy with your living situation, it may be in your best interests to move out. The letter should be delivered to the building owner according to the Notice of Intent to Vacate clause in the lease. Typically the notice will need to be made 30, 60, or 90 days before vacating the rental property. Things don’t always work out as neatly as you would like. You may need to move before or after the end of your current lease. In that scenario, you’ll need to verify the clauses in your lease about early termination fees. If your new place won’t be ready for a few months after your current lease ends, you might need to discuss arrangements to pay on a month by month basis. This would be preferable to signing a new, year long lease. Extending a lease or breaking a lease are issues you’ll need to handle separately from the notice of intent to vacate. You will still need to furnish a letter to give your landlord notice. This letter is primarily a precaution for the building owner. This allows them time to show the rental unit and ensure that they won’t be without tenants unexpectedly. For the renter, this letter serves as a legal record of their request to terminate the rental relationship. This verifies a few things so that there will be no confusion or extra fees accrued. The date the rental is relinquished: A written record of the date is important if there are any questions regarding further rent payments. The date of the notice of intent to vacate: The actual date of the letter shows that the time requirement from your original lease was followed. A request for a walk through of the property. A request for a final walk through of the property with the owner is necessary to assess any damages that may need to be fixed. If there are repairs necessary, renters may offer to fix the issue themselves or the cost might be taken from their security deposit. A request for the return of any security deposits. Disrespectful housemates is a reason many people choose to get a Notice of Intent to Vacate. Providing a notice of intent to vacate is stipulated in the lease. The lease may also automatically renew. If you have a one year lease, you may automatically be renewed for another year if you don’t provide the landlord with written notice that you intend to move. If you verbally tell your landlord that you want to move on a set date, it’s possible that the verbal notice will serve well enough. That’s providing that there are witnesses to the verbal notice or other means to verify it. The landlord may also amicably agree to a verbal notice. However, the written letter provides you, as the tenant, with written proof that you’ve met the time requirements in the lease. It also verifies any final walk through to assess the property and recoup your security deposit. Without a written record, you may have difficulty meeting the requirements to obtain your full security deposit. You may even be charged further fees. It is a simple, straightforward business letter. You need to include all of the pertinent information necessary to meet the requirements of your original lease. The Date. The date of the letter is important to show that you’ve met the notification requirements. If mailing, you should also make certain that the letter is postmarked within your time frame. For instance, if you need to give 60 days notice, you’ll want to make sure that the postmark shows that it’s mailed 60 days prior to the move out date. You can also send the letter with more than 60 days notice, giving the landlord time to receive and review the letter. The Landlord’s Address. This is a professional record. Regardless how you intend to deliver the notice, it should be properly formatted with the recipient’s correct name and address. The Date You Intend to Vacate. You need to give a specific date that you will be moved out of the location. The Name of the Apartment Complex or Address. Many landlords own multiple properties. It’s standard to include the name of the building complex, address, and apartment number of the unit you’re vacating. In the case of a rented home, the address would suffice. A Request for a Final Walk Through. A Mention of the Clause in Your Original Lease. This can be a quick sentence after the date you plan to move out, stating that you’re giving the required amount of notice per the original lease agreement. Your Forwarding Address. You’ll want to include a forwarding address in this letter for a few purposes – this will allow them to have your information on file in case they need to contact you about mail delivered to your old address. It will also allow them to mail your deposit back to you. Each rental situation is different. These are some of the most common questions asked about furnishing a notice of intent to vacate to your landlord. How do I send the letter? It’s advisable to send the letter with tracking to show that it was delivered. Some renters will hand deliver the letter. If you’re concerned about severing the relationship with the landlord, it’s always preferable to send it certified so that you can verify the receipt. Do I need to send a letter if I’m breaking the lease? Yes. If you’re breaking the lease, you’ll still want to document the time frame you’re giving the landlord on your departure date. There will be other issues that you’ll need to address per your original lease agreement and there may be fees associated with leaving prior to the end of the term, but those will be separate from this notice. Can I state my complaints about building management in the letter? No. This notice is a simple record to show that you’ve met the time requirements and stipulate when you’re moving. It serves as your record for any disputes, as well. This is not a venue for complaint. If that’s necessary, you can research where to write the letter of complaint (building management, governing bodies, etc). Does this guarantee my security deposit is returned in full? No. If you are leaving the premises in good standing, you should request a full return of your security deposit. The letter itself does not guarantee its return if there is damage to the premises that will need to be repaired or other issues you may need to pay for before you sever the relationship. In most cases, though, the security deposit should be returned to you providing you’ve met all of the lease clauses and completed a full walk through with the property owner. You may be wondering if you can just call your landlord and tell them you’re moving. You can, however, creating this letter provides you with a written record that you’ve met all of the obligations to terminate the arrangement. Creating this document is a straightforward process. While you may never need to use the document in any sort of dispute, the act of following the letter of the law also indicates that you will follow through on requiring your security deposit back. This step can often streamline the process for tenants and building owners.